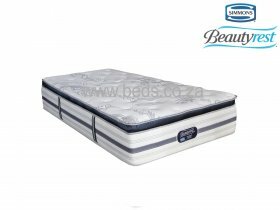 The Simmons Recharge Ultra - Luxury Pillow Top is a luxurious pillow top pocket spring mattress with latest generation pocket springs and natural fabrics to give you a unparalleled comfortable nights rest. Simmons Beautyrest® NxG™ (Next Generation) Pocketed Coil : provides increased back support and motion separation for undisturbed sleep. No-flip Mattress with Energy Foam™ Base for added stability and Handles for ease of lifting and turning .